The world we see is a reflection, only as clear as the lens of our perception. This photo reminds me of that. The mirror, aged and worn, distorts the images reflected upon it. What old beliefs do I hold which make my worldview distorted? I'm discovering them by listening to my emotions. My feelings, when positive, let me know I am seeing clearly. When I have some negative emotions, these are letting me know there are spots on my mirror of life, which I have the power to lift. I love the time-worn appearance of this mirror and I am choosing to love my negative emotions--they are invitations to choose another path. Posted by Jaclyn Trecartin at 14:49 Be the first to reply! For me, simple is really powerful. Simple, to me, means easy- not a struggle. Effortless, like calm breath. These lilacs and lupins are touchstones of the simplicity of the abundance all around. Beauty IS everywhere. These flowers and the vessels they are in are examples of gifts freely given. The lilacs are from the tree the previous homeowners planted (thank you for that). The lupins are garnered from wildflower havens on a walk (two of which two little girls walking with their grandfather picked for me as our paths crossed). The vases they reside in were gifts from people who know I love handmade items and have a soft spot for cats. A willingness to see the loveliness, and welcome it in is a powerful decision. It shifts perception and the reality created. I believe we all are worthy of remembering this. Here's to celebrating the ample gifts and glory around us. No matter how off a day is, how cranky I am, when I remember I can see the beauty and choose to look for it my mood lifts. Simple. Empowering. 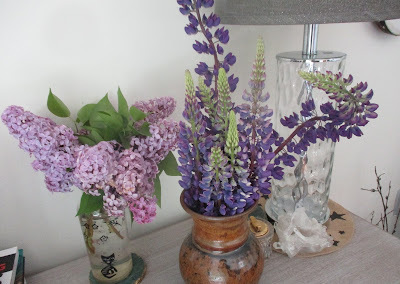 Thank you, lilacs and lupins. Posted by Jaclyn Trecartin at 10:05 Be the first to reply! Inspiration welcomed on an errand venture. Canterbury Street delights, Saint John. Photos and poem by me (Jaclyn Trecartin). 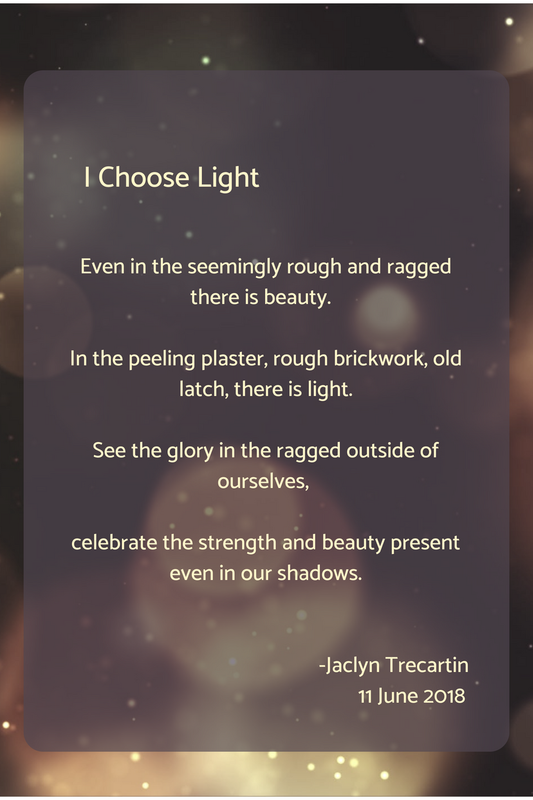 I do choose light. Posted by Jaclyn Trecartin at 13:10 Be the first to reply!